All your electronics will belong to the U.S. military once it completes its new line of cyber-attack weaponry. If there's one thing I've learned from watching Battlestar Galactica, it's that networked systems are vulnerable to cyber-attack, which is why I've un-networked all of my systems as of last year. It appears I did so it right on time, as the Navy is developing an airborne electronic attack system that seems remarkably similar to what allowed the planet of Caprica to be destroyed by the Cylons. 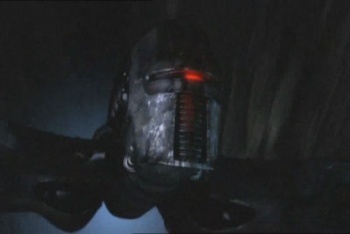 In BSG, humanity's space fleet was disabled by a Cylon cyber-attack that left it completely defenseless, and it was summarily destroyed save for a small fraction of ships. As detailed in an article on Military.com, the U.S. Navy wants a similar system in place by 2018. It would be "a weapon system that can deliver cyber-effects through free space into an aperture." I don't know about everybody else, but I have no desire for cyber-effects to be delivered into any of my apertures. The cyber-attack system is being designed for a fighter-size aircraft such as a UAV. It would emit "data beams ... packed with specialized waveforms and algorithms that work like keys to open networks." The article gets quite complicated and details the various development hurdles and possibilities. Another reason the cyber-attack system sounds like Cylon-inspired technology, if I'm reading the article right, is because some of its behavior is expected to be automated. I hope none of you have networked systems out there. The end is near!